I love fashion, especially accessories. I’m passionate about showing personality with my original jewelry designs, I want to be a style trendsetter. Can you say fashion diva? This blog is a great way to have a mini showcase every week of what I’m thinking or creating in my studio. I’m documenting my celebration of life through jewelry with bold colors, dramatic shapes and twinkling accents. So come join the party. Dramatic Purple Diva Necklace shown above has plunging double layers of eye catching teal and purple fashion buttons hanging from two strands of silver chain. Big bold buttons are handpicked and long silver loops link the fabulous buttons in pendant style drop. This fashion accessory adds fun to any fashion ensemble. Original Lucky Charm Bracelet shown on the right has clusters of colorful beads and fun buttons in shades of orange, peach and yellow mingled with silver charms. This cute handmade jewelry design has everything to make your style charming. More than a charm bracelet, this accessory stands out with repeating patterns of beads, handpicked buttons and loads of charms. With colorful jewelry, pretty flowers and sweet chocolate to choose from for Valentine’s, I’ll take jewelry thank you very much. Flowers are lovely, but don’t last and chocolate makes me gain weight. Jewelry is a symbol of love that lasts forever. Do you want love that lasts? From jewelry we can learn something about how to make a relationship last. If a handmade charm bracelet, or a pair of long dangle earrings are made with care and creative inspiration they are strong in form and design and can last longer than many relationships. But why? The jewelry designer’s thoughtfulness in selecting the right beads, buttons and charms that go together in a new fun earring, statement necklace, or chunky bracelet design is the starting point of a magical combination. Not every bead goes with every other bead, but there is a match for all of them somewhere. Then when the jewelry designer joins the selected elements together, they take care to make their jewelry creation strong enough to handle many daily challenges. So when you wear your new uniquely designed jewelry, it makes your outfit look complete. The design is so interesting and innovative that it stays fashionable and not just a passing fling. There is depth there that speaks to you. In years to come you never tire of the beads, semi precious stones, charms and even buttons, because they keep their sparkle with just a little bit of loving attention. The Drop Dead Fashion Earrings shown at the top are made with large green faceted beads and bright green fashion buttons. I carefully select button shapes and bead colors to create unique earrings no one else has. Have fun dressing up with cute jewelry that is available in many feature flattering colors with pretty bead and button details. You’ll look gorgeous wearing these stunning earrings. Fab Party Earrings shown above on the right are cute long drop dangles that use quirky button shapes in a unique three button design. Colorful flower buttons alternate with bright fashion buttons in daring dancing dangles. All buttons are linked in long strands with silver loops to create enticing flirty earrings. So get yourself out there and go dancing in vivid Fab Party Earrings. Princess Earrings shown on the right are romantic bead drops featuring small accent beads and bright fashion buttons hanging from a larger bead. These long dangles are sophisticated with opulent smoky turquoise fire polished czech beads and green fashion buttons mingling together with smaller bright green beads. Put these flattering darlings on and transform yourself into a princess. I design jewelry based on my fashion style and hope other women and style divas like my fun accessory creations too. I don’t follow fashion trends I have my own style, so I started making my own handmade jewelry to get the bold designs I imagine in my mind but can never buy in the stores. 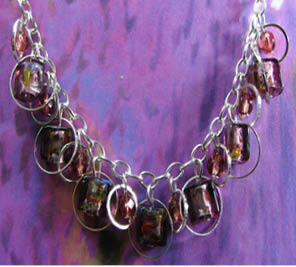 For my style I go for details like colorful fashion buttons, 2-tone beads with shimmery textures and big silver charms. When making my earrings, bracelets and necklaces I love the magic that happens when combining these fun elements together, like flowers buttons with shiny beads, or pretty butterflies charms layered over big buttons for cute drop earring designs or fresh new charm bracelet styles. I freely use beads and buttons in striking red, pretty pink, vibrant purple, lush green and bright blue. I also look for interesting bead and button shapes that can be incorporated into a design and I will mix many elements together for a chunk bracelet or statement necklace that is bold, bright and fun. I gravitate towards fun original handmade jewelry, because the cute bold designs make me smile and then I react more positively to what’s going on around me... even if it’s raining. It’s positive reinforcement through jewelry. Check out my friend Isotta’s fabulous fashion blog called Red Velvet, she just wrote about my jewelry designs! Enchanted Destiny Bracelet shown at the top has deep purple flower buttons connected in a unique half twist jewelry design. Shiny purple accent beads seem to float above the buttons on silver connecting loops. It’s your destiny to own this pretty accessory. The combination of small shimmery beads and colorful fashion buttons make this bracelet a fun favorite. Unique Button Girl Earrings shown above are a cute fashion accessory for girls and women. These flattering drop dangle earrings pair colorful fun button shapes together and only the most adorable buttons are used. Sassy handmade earrings have fashion flare and will be favored by adorable gals everywhere. This refined Sweetheart Necklace on the left is made with faceted beads in pretty pink with rectangular champagne glass foil beads. Original necklace has flattering draped design that will compliment any outfit and fashion style and works for all occasions, even as a chic bridal party necklace.